Founded on December, 20th 2000, China Tietong is a leading player in China domestic telecommunications market and also recognized as one of China’s major basic telecommunications enterprises. Ever since its acquisition by China Mobile in 2008, China Tietong runs as one of China Mobile’s subsidiaries. To satisfy the ever-growing customers and improve the system efficiency, Tietong selected Synway hi-speed SS7-enabled SMG2120/SMG3064 VoIP Gateway for telecommunications IP calls and global business infrastructure at the beginning of 2014. The solution offered by Synway allowed Tietong to remain the existing VOS2009 system and its IP PBX to maximize value at the lowest cost. With total staff of 72,000, TieTong has established 31 provincial branches , 321 municipal branches and five holding subsidiaries across China. With its nationwide networks, advanced technology and complete functions, TieTong demonstrates its high competency in quick response and flexible networking, due to its completely uniform dispatching and management over all its networks. Currently with its various services covering nearly 300 LANs nationwide, TieTong has 400,000 kilometers of phone lines and its total switch capacity of over 50 million lines. In addition to varied value-added services, currently it also offers basic telecom services to the public, including: Local telephone service, Domestic Long-distance telephone service, IP telephone service, Internet data transmission service, Internet, video, cards, Calling Center service, Internet VPN service, Network hosting service, fax store and forward service. Besides its owned IP and TDM network for VNO system, Tietong outsourced its value-added service such as IDD 17995 and hardware infrastructure to a third-party vendors for many years. For growing call needs,It was in urgent needs for Tietong to find an ideal solution provider with telco-grade hardware available for power redundancy and backup. Only in this way could Tietong meet the rapid-growing communication needs, fully boost up network efficiency and make full use of the existing network facilities in a more comprehensive way. 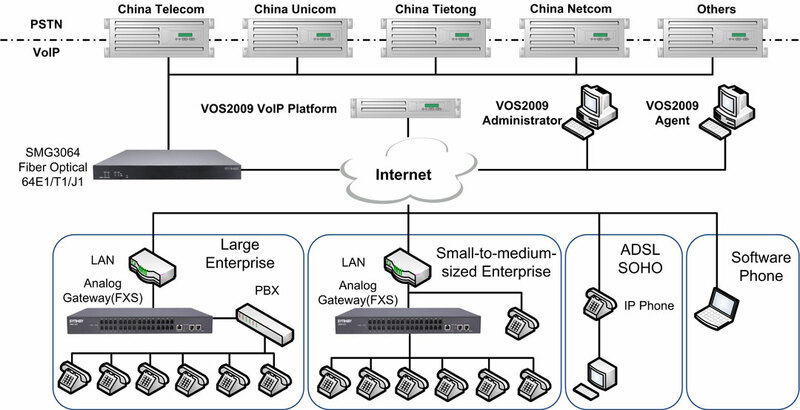 For a long time, Tietong deployed distributed gateway for its VNO business, connecting to PSTN users via SS7 signaling. However, the success rate for connections could only be around 90% when the device was fully loaded(during holiday peak time). And even successfully connected, there still might be up to 10 seconds delay under network full load situations. To address the above problems, Tietong needed a brand-new, highly adaptive and available for backup operation system to achieve more efficient call access and system redundancy at less expensive cost, which its traditional vendor failed to provide. In addition, what also troubled Tietong was to develop an instant and efficient solution so as to better balance the loads, further raise the network efficiency and keep the whole system steady under high density case where concurrent calls were up to 5000chs per minutes. Usually under large capacity environment the voice quality tended to be poor and communication efficiency becomes so low and caused high churn rate of customers. Last but not least, telco-grade stability, power redundancy and cooling system were also top concerns for Tietong. The solution should not only meet the high demands of 24*7 non-stop for complex environments, but also ensure that the MTBF can reach 160,000Hrs. Besides, to reduce investment and time to market, it must be completely seamlessly integrated with AVAYA, CISCO, Huawei IP PBX and the leading VOS IP systems. 1. Robust enough to run 365*24 non-stop operation based on Synway’s telco-grade software/hardware infrastructure: Synway newly launched VoIP Gateway is elaborately designed in a compact 1 U chassis with multiple user-friendly features such as reductant SS7 signaling, dual-power hot-swap, 2*1000M Ethernet ports, automatic diagnosis and reset as well as multiple intelligent cooling system, assuring stability and reliability of the entire system. 2. Good compatibility with third-party IP PBXs and management software: After configuration, Tietong was pleased to find out that Synway SMG2120/SMG3064 could interconnect with existing IP PBX(AVAYA, CISCO) perfectly. Besides, Synway also provided configurable interfaces for VOS system so that Tietong could develop more value-added services without changing the overall system architecture. 3. Higher connectivity success rates than other VoIP gateways providers: Leveraging two decades of expertise in SS7 signaling technology for SP services worldwide, Synway VoIP Gateway possesses superior features, including free auto-backup between ISDN-PRI and SS7(SS7 link backup). Also SS7 signaling technology can support up to 96 links(64Kbps), which efficiently shortens call connectivity cycle and improves success rates. With strong abilities including call “handshake”, error control, redundancy backup etc., users can expect better calling experiences in the long run. 4. Perfect full load ability and voice quality under high density situations: Synway VoIP Gateway is capable of presenting crystal clear voice quality without delay even when concurrent calls are up to 5000chs per minutes. With exclusive software/hardware technology(EC, QoS, CNG, ToS, Jitter Buffer) for voice optimization and dedicated SIP-based chipset, it features automatic IP resources balance, overload protection, reasonable IP allocation and minimum bandwidth cost. The solution offered by Synway allowed Tietong to develop more competitive VoIP systems. Based on SMG2120(120Chs in 1U), SMG3016(480Chs in 1U) and SMG3064(1890Chs in 1U), Tietong was able to deploy an easy-to-use VoIP solution with friendly user experience, high scalability and communication efficiency within a short time. 4. Advanced voice processing and SS7 signaling ability to ensure superb VoIP communications experiences.